HS: I don't have any stats for the years you played. I didn't find any yet, but I will keep looking. Do you remember if you had any that placed you in the postseason recognition by The Review or OVAC? HS: We started the "Current Potter Stars" section on the East Liverpool Historical Society Website in the spring of 2010. We have no information prior to that yet. [After this interview, after spending some serious time on the internet we did find some picutres and stats for Hali which has been worked into this interview. Some were from 7th & 8th Grade as well as high school. We also found some stats for some other girls for 2009-2010 which we will add to the Current Potters Stars Section of the EL Historical Society Web Site. ELHS Web Site Webmaster. We have been going through newspaper clippings of Wendy Baker and Robin Sayre. They both had loaned me the newspaper clippings that their parents or grandparents had clipped out and saved from their playing days. We are using those in an effort to begin to compile the girls sports stats and records. Hali: Is that like stats from games? I have a lot of those. HS; Well if you have those and wouldn't mind lending then to us for a while we could use them to broaden those records. Hali: My mom kept a lot of mine. We never had any feedback on how many points we had scored at the end of the season. Hali: I have a lot of clippings and stuff when we played even like game photos. HS: If possible I would like to see the clippings and pick some photos to use in the article. HS: Do you have any idea what your point total is in basketball? Hali: I would imagine it's not very high. I didn't really start shooting till my senior year. Before then if someone had a better shot than me that was where the ball was going. I wasn't too focused on my scoring when I was younger. I think it wasn't until my senior year when I started scoring more. HS: When do you recall first having an interest in sports? Hali: I think it was probably when I was 5 or 6 years old when I started basketball. Ever since then I have loved it. HS: Is that your favorite sport? Hali: Yea, basketball is definetly my top sport. Hali: Playing with all the kids in the neighborhood growing up, all the older ones. I was out there nonstop every day, every day in the summer nonstop playing. HS: Do you recall when you started your first organized sports? Hali: Other than that I could say 7th grade, middle school. HS: Do your parents or you have any pictures of when you were a 7th or 8th grade player? HS: Okay, this is the one I ask everyone since I am totally uncoordinated. How did you learn to dribble? Hali: Oh geez (laugh), I had a ball in my hand since I was 5 or 6 years old. I don't know, when I was younger, my mom would always tell me go out run a few laps around the neighborhood, dribble, start out walking, work your way into a jog. At first I couldn't dribble left-handed for a while, but when I was in 5th grade, I broke my right arm, during basketball season. It was during our big rival game with Beaver Local. I couldn't play, so from then on when I had my cast on everything was left-handed. After the cast came off I used to sit there and dribble 200 times right-handed switch and dribble 200 times left-handed. HS: I had talked with one person who slept with a basketball. Hali: Wow! Yep, or just even laying there watching TV while you dribble. 1/20/05, BEAVER LOCAL, 7th Grade: "Potters Burst Beavers Dam"
The Beaver Local Beavers invaded the Lady Potters gym on Thursday and the Potters burst the Beavers dam. 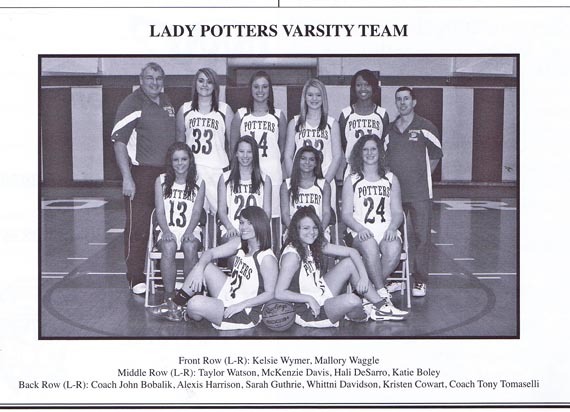 The Lady Potters played one of their best games of the year to post a 40-24 win over the Beavers. The gym had a great game atmosphere with a large crowd on hand. . .
On the game side, Haley DeSarro had a great game for us today scoring a season high 18 points and playing great pressure defense. Haley used her speed and quickness to steal the ball and get a lot of break away lay ups. . . The Oak Glen Golden Bears visited the Lady Potters confine on Monday, January 10th, and handed the Lady Potters their fourth loss of the season. The Lady Potters played a good first half of basketball and led 15-8 at half time, but let the Bears dictate the second half of the game and the Bears won 24-19. HS: Would you consider yourself competitive? Hali: I am very competitive. I'd say I'm competitive. HS. It has been said that there is a desire to play. That there is also a desire to win and and they aren't always the same. Some just want to play and some people want to play but also they want to win, that playing alone isn't good enough. Which would best describe you? HS: I remember seeing you play, 2009-10, I guess it was your senior year? HS: You definelty looked different than some of the other girls. You looked much more intense. Hali: Oh yeah, I was really competitive then. HS: Just my opinion, and I could be wrong, there did seem to be a couple girls, and I'm not going to mention any names but they didn't seem as into it. Hali: Yeah there are a few. I don't know, I think you really have to have it in you to want to win. Otherwise, most of the girls out there are out there just to be part of it, the team and be with the girls. HS: Overall, your involved in what sports, cross-country, volleyball, basketball and track? HS: Which ones, which years? Hali: Well basketball, volleyball, track, I did those when I was a lot younger, but I've been with those sports from the school sense, since 7th grade. HS: So in high school you did those sports too? Hali: My senior year I decided not to play volleyball and I tried cross-country instead. HS: Where do you do cross-country here? Hali: Our practices and everything are held at Thompson Park. Sometimes we would go out to Beaver Creek, but Thompson Park is where we would mainly run. We would go out on road runs sometimes on St. Clair Avenue. HS: What were the usual distances or did they have distances? Hali: For a meet or just practices? Hali: A meet, I think it was 3.1 miles. HS: I didn't know so I decided to ask. The reason being in 1983 Carrie Tice ran 21:20 and I wanted to know if that seemed about right or about average. Hali: Oh yeah, this would be her race times, how long it took her to finish 3.1 miles. HS: So that sounds about right, about average or normal? Hali: (laugh) I was just in that sport to stay in shape. HS: Did you ever work out? Hali: Yes I used to work out a lot. HS: Weightlifting or just running? Hali: Both. As I got a little older going into my senior year I got into weightlifting, but when I was younger I used to run for fun. I would just go out and run all the time. HS: You were versatile in track. You ran the 4 x 100 relay, 4 x 800, 200 meter dash, 400 meter dash, 800, meter run, 5,000 meter run and high jump in track? HS: Were you good at it? Hali: Yes, we had a pretty good team. 1I went from distance, I was a distant runner my freshman year. My senior year I moved into sprinting. Picture courtesy of Jim Savage. HS: I have gone to several track meets. I know more about that now than say cross-country. Hali: Not much fun to watch. HS: Grueling, are they grueling? Hali: They are so long, they drag. Hali ran a PR of 1:07.18 in the 400 Meter Dash at OHSAA District Track and Field Championships -- West Holmes, placing third in the prelims. 2010-05-20 Hali got a new season best of 4-10 in the High Jump at Columbiana County Meet, placing third. 2010-05-04 Hali ran a 29.30 in the 200 Meter Dash at Columbiana County Meet, placing 9th in the prelims. 2010-05-04 Hali ran a PR of 29.05 in the 200 Meter Dash at OVAC 3A/4A Championship, placing 11th. 2010-05-03 Hali went 4-8 in the High Jump at Brooke Wendy's Relay, placing 5th. 2010-04-24 Hali ran a PR of 25:18.27 in the 5,000 Meter Run at OHSAA District Cross Country - Cambridge, placing 58th. 2009-10-24 Hali ran a 27:21.09 in the 5,000 Meter Run at Columbiana County XC Meet, placing 37th. 2009-09-29 Hali ran a 27:03.29 in the 5,000 Meter Run at Youngstown Area Suburban League, placing 171st. 2009-09-22 Hali ran a 27:55.48 in the 5,000 Meter Run at Wendy's Brooke Invitational, placing 34th. 2009-09-12 Hali ran a 30:14.07 in the 5,000 Meter Run at Salem Early Bird Invitational, placing 87th. 2009-08-29 Hali ran a 2:54.34 in the 800 Meter Run at OHSAA District Track and Field Championships -- M'brook/W Holmes, placing 17th in the prelims. 2009-05-18 Hali got a PR of 4-10 in the High Jump at OHSAA District Track and Field Championships -- M'brook/W Holmes, placing 11th. 2009-05-18 Hali went 4-8 in the High Jump at OVAC AAA/AAAA Championship, placing 10th. 2009-05-07 Hali ran a PR of 2:43.82 in the 800 Meter Run at OVAC AAA/AAAA Championship, placing 10th. 2009-05-07 Hali got a new season best of 4-8 in the High Jump at Columbiana County Meet, placing 7th. 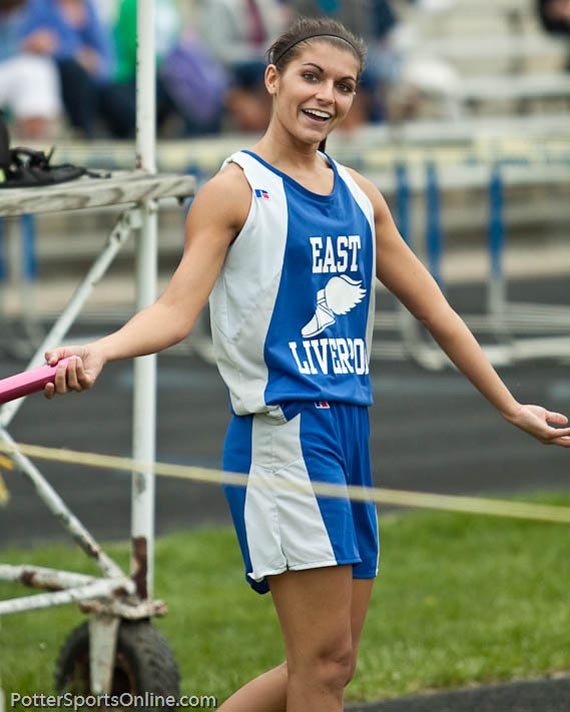 2008-05-06 Hali ran a new season best time of 1:09.80 in the 400 Meter Dash at Columbiana County Meet, placing 11th. 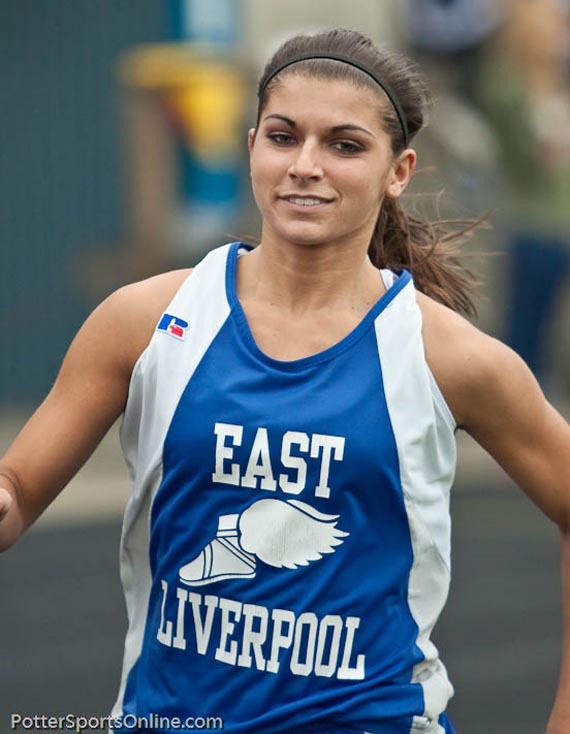 2008-05-06 Hali ran a new season best time of 2:52.98 in the 800 Meter Run at Columbiana County Meet, placing 10th. 2008-05-06 Hali ran a 1:13.99 in the 400 Meter Dash at Fred Tweedlie Invitational, placing 10th. 2008-03-29 Hali ran a 2:57.70 in the 800 Meter Run at Fred Tweedlie Invitational, placing 5th. 2008-03-29 Hali went 4-6 in the High Jump at Fred Tweedlie Invitational, placing third. [A little humor] Drum Roll Please. Picture courtesy of Jim Savage. 2008-03-29 Hali ran a new season best time of 2:45.69 in the 800 Meter Run at Metro Athletic Conference Championship, placing 10th. 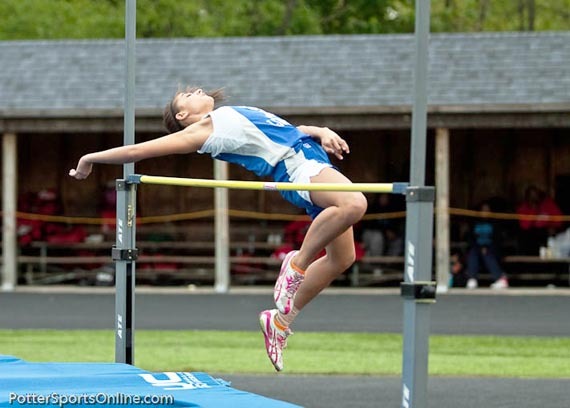 2007-05-11 Hali got a new season best of 4-6 in the High Jump at Metro Athletic Conference Championship, placing 7th. We don't have much for high school volleyball but we do have this which is nice. 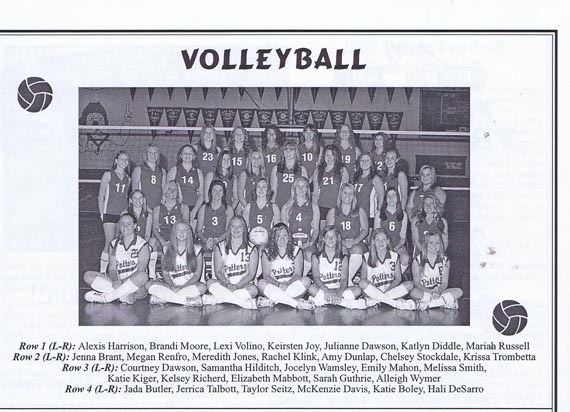 Player Hali DeSarro in 2007 far right back row. Picture courtesy of 2012 Potters Football Program. Coach Hali DeSarro in 2012 far left back row. HS: Which team did you love to beat in basketball or volleyball? Hali: My number 1 was Beaver Local. (laugh) and my 2nd would have to be Oak Glen. I have a lot of friends from both teams and I played against them in a couple different sports. 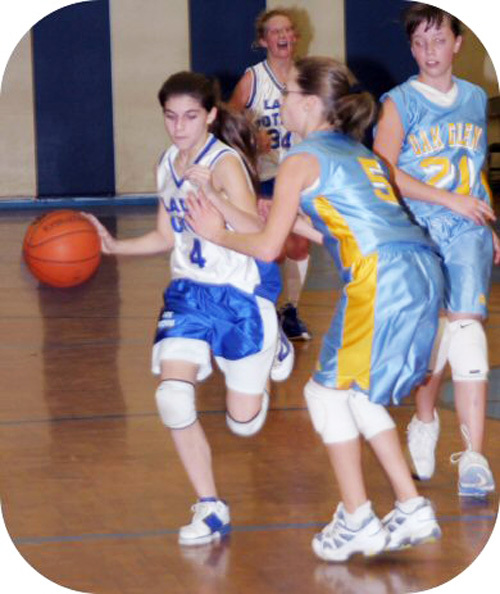 When I was younger my AAU team actually were all Oak Glen girls. So it was nice to play against them in high school. HS: Wellsville used to be a big deal. HS: What games have stuck in your mind over the years that you played here in school? Hali: My senior year at home against Beaver Local was one. My 7th and 8th grade games against Beaver Local. Beaver Local was the main game that stuck out to me. HS: I watched that home game against Beaver Local that year. You did win that game. As I recall you girls only won 4 or 5 games that year. Hali: Yes, we didn't have a very good record that year. There were few differences between us our senior year. With girls of course, there is always some drama. It was just one of those years. HS: What opposing player stuck in your mind more so than others? Hali: I feel like I kind of saw everyone the same way. I wasn't really more worried this player than I was that player, I think I felt same about all of them really. HS: How about any player on another team you felt you had a special competition with on say Beaver Local or Oak Glen? Hali: Well, I could say Sam Cianni. I played with her growing up. She was Beaver Local and it was the big rival. 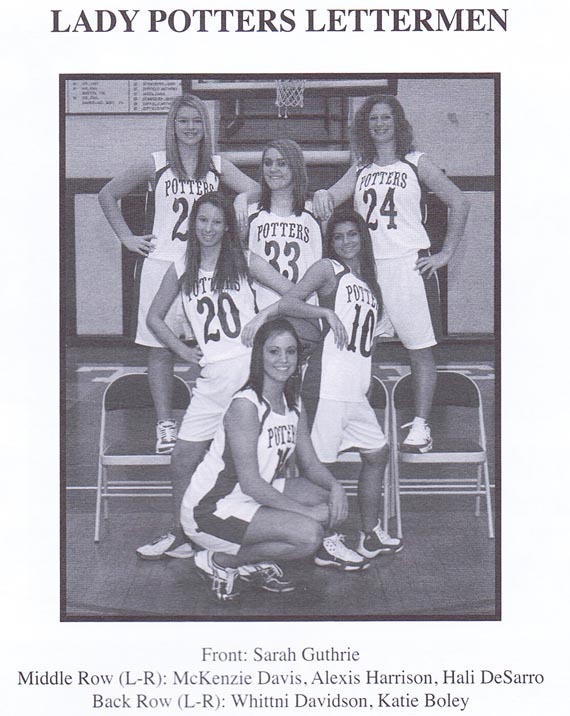 She was Beaver Local's point guard. Oak Glen's point guard Payden Eckelberry I played AAU with. We were on the same team so I think there was always a big competition between us when we played AAU as to which was the better point guard. Same thing with Sam too. I'm still friends with both of them but every time we played we were competitive. I think it always made those games more fun. HS: So Beaver Local with the team you want to beat the most? HS: You played volleyball how many years? Hali: Starting from middle school, 7th and 8th, 9th and 10th. Four years with East Liverpool. HS: Track was how many? HS: Do you have a game face? Hali: Game face? (Laugh) Oh, I don't know. I mean, as soon as we get on the court to where I am up, I am serious. I don't really joke around about anything, it's about the game from then on, then till the final buzzer. HS: Were you nervous before game? Hali: Oh yes! There were some games I was shaking even out there getting ready for jump ball and that lasted until a couple minutes into the game when I was fine. I get nervous for every game even if it would be an easy one. HS: Were there such things as easy games? Hali: Well there were a few teams we played that were easy. In freshman year we played big teams like Salem and Howland. Those were some pretty big girls. I was a little Freshman out there. I was really nervous. HS: How many letters did you get all together in high school? Hali: Let's see, four year letterman in track, three-year letterman for basketball. I don't' think I lettered at all in volleyball. I quit playing volleyball my Junior year. Then 1 have one in cross country. So eight letters. How did you end up at Penn State Beaver, did they recruit you? Hali: Yes, my Junior year the coach came down to the school. I didn't know this campus was up there until the coach came down. He talked to me my Junior year. He came back my senior year then I went up there after graduation. HS: Do you find it interesting and very different than high school? Hali: Yeah it was a lot different. HS: Did you live up there or did you commute? Hali: My 1st year after I was recruited to I drove from home every day. It was a long drive I would get in late from games, sometimes at 1 in the morning from being on the road, then drive back home, another 45 minutes. 1 would have to get up in the morning for an 8 o'clock class. It was rough, so my 2nd year I stayed up there. I got an apartment. The playing is a lot different than high school. Hali: Yes a lot faster. Hali: (laugh) Yes. Yep, and they are all out there to win so you don't get a few of them who are out there just to be out there. A difference in high school and college. We had a lot of low-scoring games in high school and sometimes you would battle it out for those last few points to win. When I was in college my freshman year, we had three all Americans on our team and sometimes we would blow teams out by 60 points. The refs would sometimes say, "how far did you travel to play?" We would travel three or four hours to play these teams. He would say, "you're blowing them out by 60." HS: Are you still playing basketball? Hali: No, this past season I didn't play. I was up at Beaver. I played for 2 years but I couldn't continue with my major there so I had to come back home and quit. I'm enrolled in Kent State here. HS: Kent State used to have a team here. Hali: I wish they still did I'd still be playing if they did. HS: In one of the interviews I did with one of the former Lady Potters I was told the reason boys play sports with to get a girlfriend and or get recognized, possibly for college admissions. I'm not saying that is true, mind you. Any comments? HS: Why do girls play sports. It wouldn't be for the same reasons. Hali: No, (laugh) I don't think so. At Beaver a lot of the girls are competitive with the guys too. We had the girls team always light it up when the boys team was practicing. The girls out there like saying I'll play you one-on-one, 1'l1 beat u. The girls are competitive but I don't think they are out there for the guys. (laugh) I think there out there for themselves. Hali: Yeah. We were a lot closer. I was close with my teammates back here but college your together 24 7, what with practice, 2 a day practices, sometimes classes together. You're together a lot more. I think we were a lot more closer up there than my team back here. HS: Would you play, if they let girls play, would you play in East Liverpool basketball alumni game? Hali: I would play. I'd do anything to still be able to play. They have a guys alumni game but not one for the girls. That's disappointing. I would like to be able to play in the alumni game. I would like to see a girls alumni game. They have an alumni game up in Beaver but I wish they had one here as well. HS: A Separate or joint game? Hali: Oh Geez. If we played with the guys they would never pass us the ball. (laugh) So I think separate would be better. (laugh) The girls I used to play with, the girls that are my age, that is what we always said, "How come we don't get an alumni game that we get to play in?" We didn't figure it would ever happen. HS: You can't play now unless you talk Kent state into getting a team again. Hali: Yes, unless unless Kent State got a team. If they did I would be there. H.S: Beaver, was that division 1, 2 or 3? Hali: We were Division III just a small school. HS: You're coaching basketball now? Hali: Well, as the 7th grade head coach. I'm in the process right now of being moved up to the high school JV team. HS: Well, that is a big court up there. HS: So you had to be in shape to play up there. Hali: Yep. So I told my girls if you're in shape your going to be able to run all over any team you play. HS: How good was your team last year in 7th grade? Hali: I had some pretty athletic girls. They were the ones who wanted to work hard, wanted to win. That's always a plus. You know you get some teams, the girls are out there but they don't want to work hard. They just want to be out there. But every one of the girls I had last year worked their butts off. So, 1 didn't have any complaints. It was nice to see they really cared that much, being that young too. What do you feel about playing vs coaching. What do like about it? Hali: I miss playing and I hate going out there seeing girls who are not really out there to win, but to just be out there that don't really care. I think in coaching making my girls realize that hard work pays off. If you work hard you're going to get farther. I think I like that the most, making my girls work hard for something they really want. HS: Are you planning on staying in coaching? Make it a career maybe? Hali: Yes. I would definitely like to stick with it. I enjoy it. It's a lot different than playing. A lot, I have learned a lot more, even with all the years I've been around it, I have learned a lot more in coaching. HS: Going to coach in college maybe? Hali: Maybe, we'll see. I'm still in school right now. I don't know where I'm going to be after I graduate but I would like to still be coaching. HS: There seems to been a lot of turnover in coaching here in the recent past in some sports. Hali: Yeah, is like every other year you don't know who your coach is going to be. When I was younger you would know when I get to high school this is going to be my coach. Now you kind of play it year by year and you don't know who your coach is going to be. You don't know how much experience they are you going to have, you don't know how long they are going to be there. HS: You could be a head coach. Hali: I would like to be some day. HS: What all more is involved in coaching that maybe wasn't in playing? Hali: A lot more patience then being out there on the court playing and I realize that some girls learn differently than other girls. HS: What about paper work.Do coaches actualy keep records or does someone else do that? Hali: Well, we have a bookkeeper. My mom was my bookkeeper for our 7th & 8th teams last year. Those books didn't include a column for, doesn't keep track of rebounds and steals and how many rebounds individual girls got. It's just points,foul shorts and that kind of stuff. I think it would be nice for someone to keep track rebounds, steals and things like that as well. That might be the way some girls really stand out and they don't get recognized for it because those kind of things aren't recorded or or kept track of. HS: How do you go about trying to change things when things aren't going well when you're coaching? Hali: My girls sometimes last season would get frustrated a lot. They might get in foul trouble. They would become frustrated and I would have to remind them to take it easy, sit down, calm yourself down for a minute, then get back out there, pick your head up. You made a mistake, so what? It's done and over with. You can't do anything about it now. Get back to the next play. Once it is made you can't do anything about it anyways, just work that much harder on the next play to make up a mistake you made. HS: You're volleyball coach too? HS: You were with the high school last year, right? 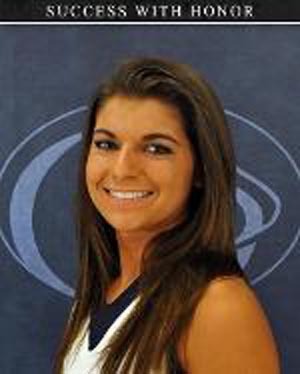 Hali: Yes, last year, volleyball was the first thing I started coaching last year. My first year. HS: What was your impression of what you accomplished there? Hali: I was a lot more nervous coaching volleyball I think just with it being volleyball I was coaching before basketball. It was the very first thing I ever coached. I was nervous, I hadn't been around volleyball for a while. So, I wasn't you sure what was the same and what was different. How the girls were gonna be. I think it was a little harder coaching volleyball because there wasn't that much you can tell the girls on the court. If they want to correct themselves they do but other than that if you tell them something to do to correct and then the other team serves and the ball doesn't come to that girl it makes it harder for her to correct it. Volleyball I think was little harder to coach than basketball maybe just because I hadn't been around it for a while. HS: Do you think the fact that you only played 2 years of basketball at the college level is going to hurt you if you want to keep progressing in coaching? Hali: I don't know how high, what level I would be able to go to. HS: If you begin to produce winning teams you can go to any level you want I think. Hali: Yes, that's true. I went to a smaller school too though, it wasn't like I was a division 1 player. Most never heard of the school I went to. HS: We have had at least 2 girls who have started out as assistant coaches at the high school level here, at least in one case I'm sure about, and went on to be a head coach at the high school and division 3 level in college. So I suspect you could probably do the same, if you really wanted to, at least at the high school level. Hali: Last year I wasn't too sure how coaching was going to go because my 7th grade girls that I coached, well I'm not very tall. Most the girls are bigger than me down there anyway. I'm only 5'1". I wasn't sure how it was going really go, but it went good. It went a lot better than I thought. HS: This year your coaching where? Hali: I was hired for the 8th grade basketball position. Head coach asked me if I wanted to move up so right now I have to resign from my 8th grade position and I'm in the process being approved for the JV job. HS: At the high school? HS: They are going to have the same coaches as last year? Hali? Yes, Allen Dingey is the head coach. Hali: I haven't heard yet. HS: You're still going to coach volleyball? Hali: Yes but I won't be with freshmen this year. Middle school coach just notified Mr. Shansky that she couldn't coach this year. So right now they have no one down there so I am going to move down to middle school to coach. HS: What do you think would get younger people interested in the website. There is a whole section on their about Potter sports a lot on the boys sports but we are focusing on the girls sports right now. Hali: I think that [focus on the girls] would help. Most girls want to read about how their games went but it's all about the boys. Even in the paper girls sometimes get only a little write up and the boys get all the credit. Hali: (laugh) I'll put the word out. HS: Who do you think might be willing to do an interview sometime in the near future? Hali: Players who have graduated or players now? HS. Current or past. At some point in time I have to try to get some of the women who played in the early to late 70s and hopefully some of them will be willing to do an interview or two. I have tried to get an interview with Nikayla Edgell but so far no luck. I have heard that there are some who think she may break Wendy Baker's career scoring record. Hali: She is a good player. She would be a good one to interview too I think. HS: She plays softball too. Hali: Does she? I didn't know that. She's a good basketball player and she is still young too. HS: What do you get from playing sports? 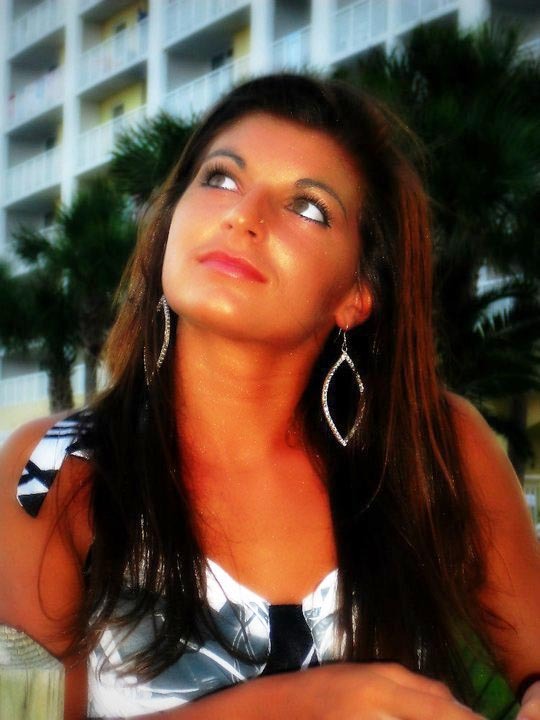 Hali: Discipline, it teaches you definitely self-discipline, I think, and just how to get along with people. I have had a lot of teammates who had their differences here and there but on the court you get along or you're not out there. You may have differences before practice for when you get out there for that it stops. How to get along with people, even new people. 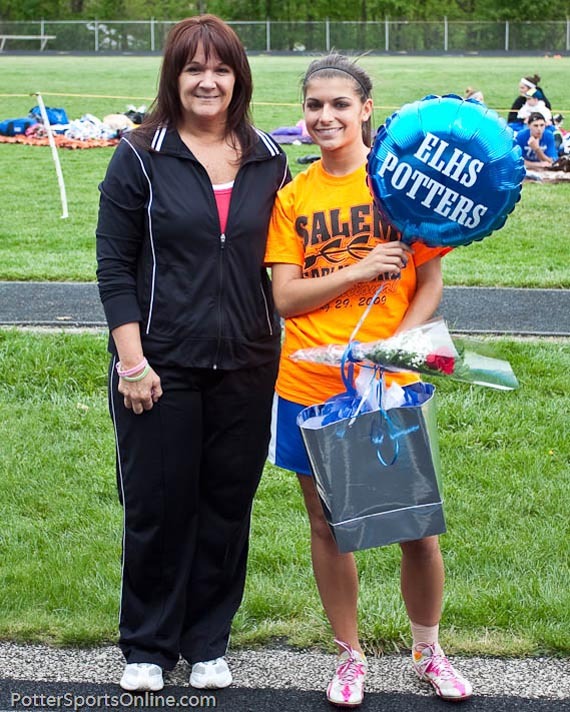 Senior Night, Hali and her mother. 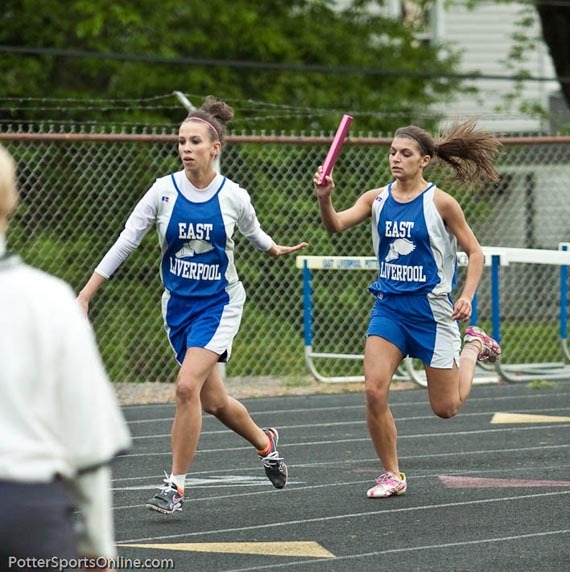 Hali's final home apprearnace as a Lady Potter Athlete. Picture courtesy of Jim Savage. HS: Can you think of any event in your years of playing basketball, or volleyball that makes you laugh when you think of it now? HS: If you run into her do you remind her of that? HS: Thank you for your time and patience. Hali: You're welcome and thank you.